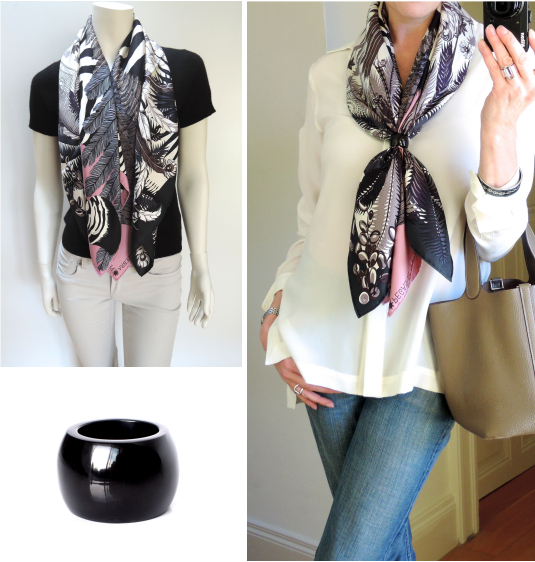 Doubling scarves is a wonderful way to add warmth, or to simply create volume or interest. As promised in my previous blog post, here are some how-to's and variations. Fold both scarves in the basic bias. 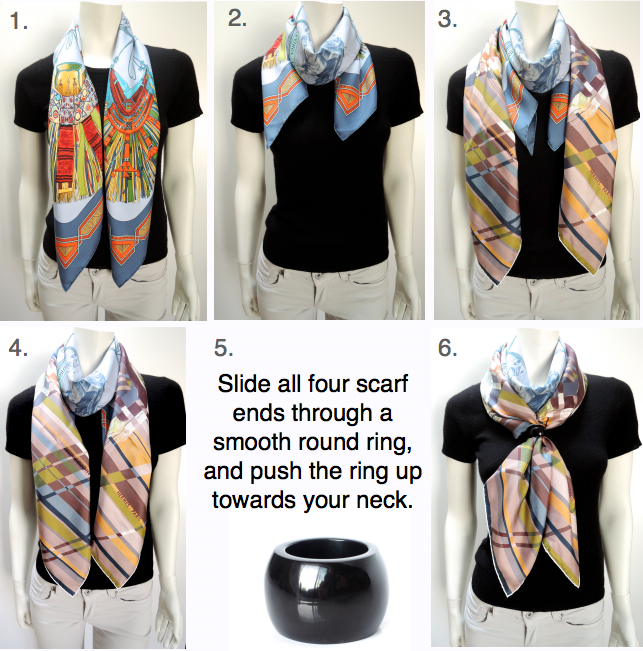 Wrap scarf #1 once around your neck, and place scarf #2 on top. 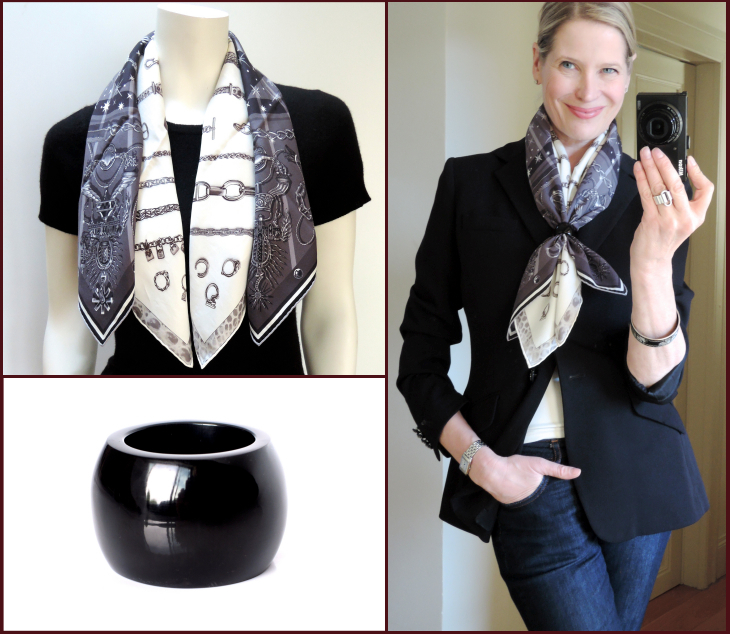 Pull all four scarf ends through a smooth round ring (here an Anneau Infinity scarf ring in black lacquer), and push the ring up towards your neck. 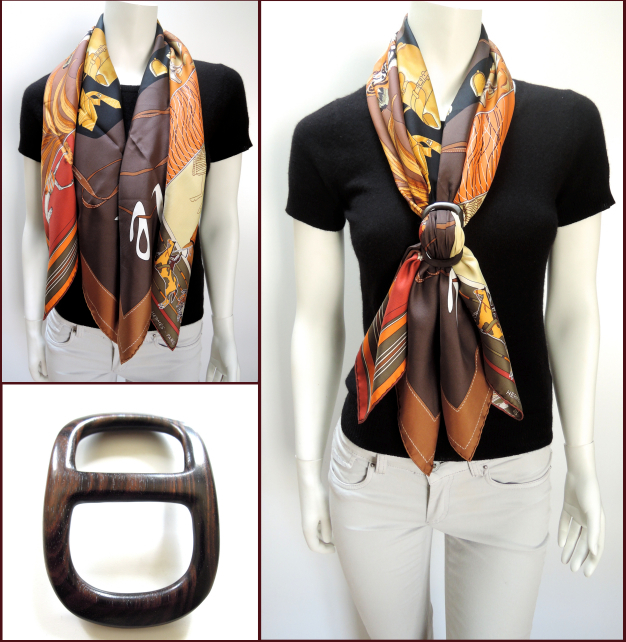 Finding pairings is fun... you can match your scarves by color, pattern or design. Even unlikely candidates might go well together in the end, as the only visible part of scarf #1 is the centre, whereas scarf #2 shows both corners and almost the full bias fold. 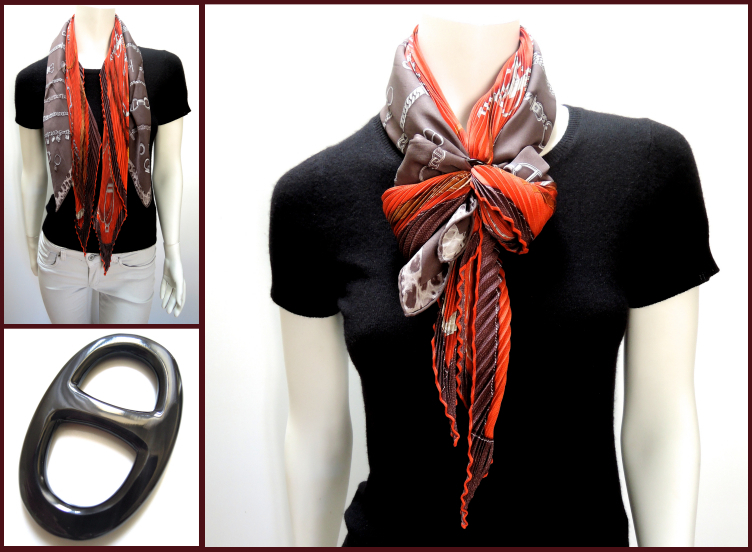 This knot works great when you'd like to highlight a scarf's centre while hiding it's corners, or vice versa. 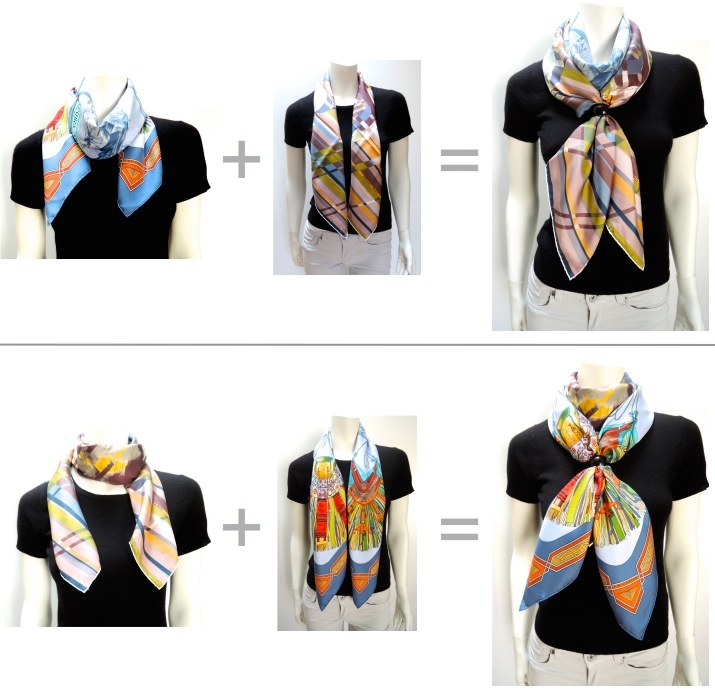 Below the same two scarves, but in reversed order, showing the different effects the placing of them have. Fold two 70 carrés in the basic bias fold and place around your neck. Then pull all four scarf ends through a smooth round ring (here an Anneau Infinity scarf ring in black lacquer), and push the ring up towards your neck. As always, I am very much looking forward to the Australian winter, and to see you rocking your scarves again! 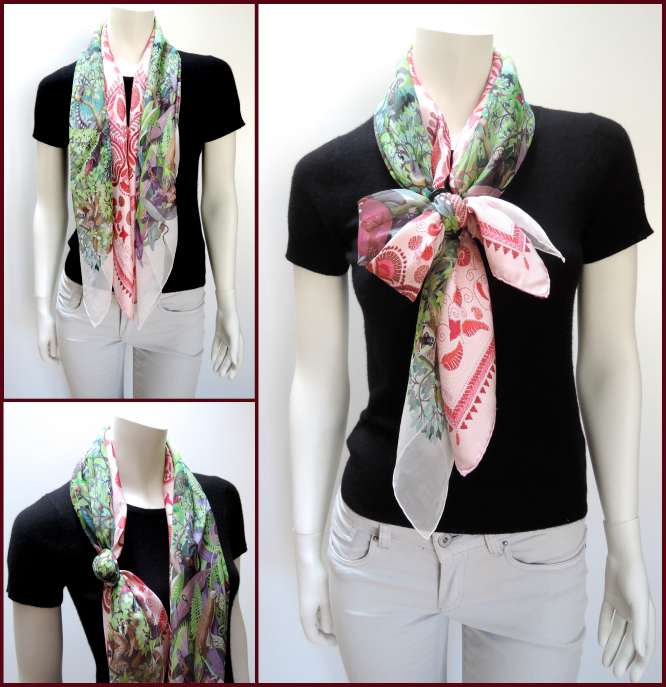 This double scarves knots are simply stunning. Such creative genius, dearest MaiTai. Call me biased, but the twist wrap variation is my fav! - AngelaB. Congratulations Mai Tai, you have done it again!!!! We missed you too, welcome back in Le Salon ! I hope everything is fine for you now and wish you all the best for 2015. Welcome back! Hope you are well now and will join us on a regular basis. Welcome back, dearest ilsa! We missed you much, and I'm so happy to hear that you are feeling better again. All the best to you too for a happy and healthy 2015! Thank you so much for showing us all the different looks and telling us how to achieve them! 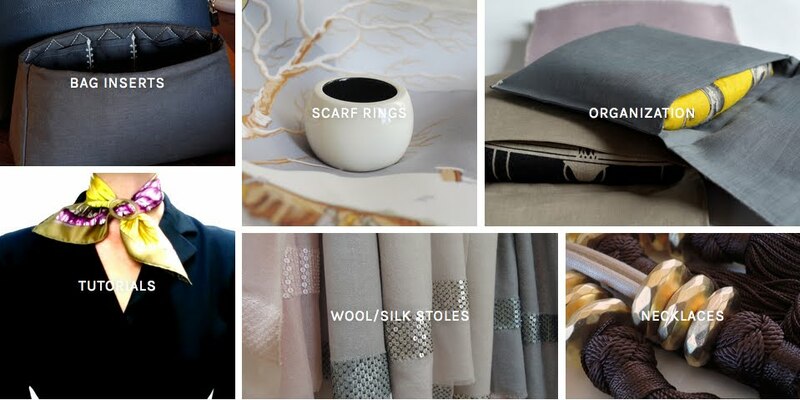 I always love to see how scarves can be worn and these ideas have really inspired me! I'm going to bring out my Maxi Twillys and see how they play together with some 90 Carres. I don't feel like I give the MT's enough love - this combination may be the ticket! Enjoy your time away but come back to us soon! Many thanks, dearest Annie. I hope some of the ideas worked with your Maxi Twillys, please let us know! Thank you also for the good wishes...and I hope it hasn't been to long! All I can is that you're way too clever for your own good, wickedly smart and talented girl! But, fortunately, we all benefit from that. I'm going to have another go at the scarf drawer, as these looks are just too pretty to pass up. And, I'd better get going, as in a couple of months, it will too hot here to wear even one scarf. Oh, my very dear Jerrine, "too hot" sounds too wonderful! I am soooo cooolllddddd. But if it were 80 degrees I'd probably be complaining about the heat. Dear MaiTai - I would have thought that anything other than a simple drape (such as the criss-cross bow knot) would be too bulky with double scarves, especially larger ones. But although it looks substantial in the photo, it does not look overly bulky. Thanks for making the instructions so clear, great photos as always. Enjoy your time away - you've been working hard and deserve a nice holiday! Brilliant, clever, ingenious ! My Dear, I bet all the MT Super Ladies in Le Salon will do their homework during the week-end !!! Oh my, you even blast it off by combining different materials! Interesting! And some fun exercise! Thank you, dear Mimi! So happy you enjoyed the post! Yes, so very clever and,as always, you make it look so easy! Like Fifi, I am concerned about the bulk, but will give it a try! For me, this may work best with the 70 silks! Love it on you though! Dear MaiTai, this is a great post, love it! I particularly like the 70s together and the Zebra P with the Belles de Mexiques, your pairings are genius, you have a great eye. It's so cold here right now I might try this tomorrow, so need to go now and research what pairings I might do. Important work lies ahead! And did you say that when wearing 2 scarves one can eat twice as much chocolate? I am sure you did. Keep warm and cosy, dear Blighty, and double the scarves around your neck! Hope you had fun finding pretty pairings, and yes, the double chocolate rule definitely applies! Stunning! I love your ideas, beautiful as always. Thank you J, so happy you enjoyed the post!